I generally feel a little lame ordering a salad at restaurants -- after all, one of the reasons to eat out is to benefit from the wisdom and verve of a real chef. 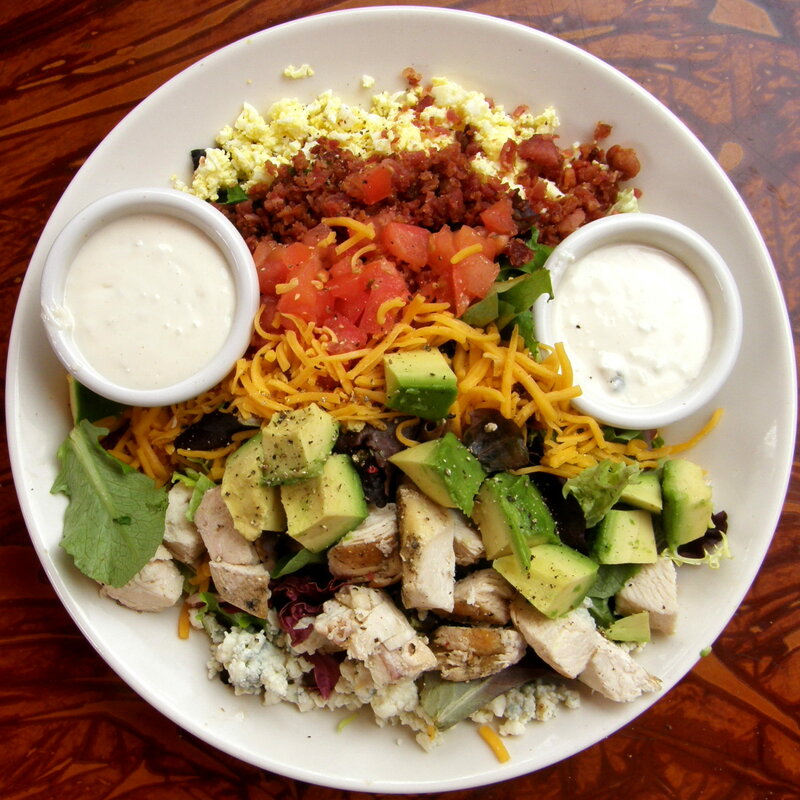 Salads are often the menu items which involve the least skill or forethought, and so I compensate by ordering Cobb salads, stacked with bacon, chicken, egg, etc. Somehow, it helps. But tonight, as I chowed down a Cobb at Trio on 17th and Q NW (Washington, DC), this flexibility as to what constitutes a salad ate at me even as I ate at it (HUMOR!). So what IS a salad? What makes a salad a salad and not something else? What are the necessary conditions of salad-ness? A salad must have a dressing, sauce, or relish which complements and connects disparate ingredients. NOTE: The above are all, of course, reliant upon the general intent of the salad creator and each can be perverted for the creation of pseudo-salads, such as fruit salad which (with few exceptions) has no unifying dressing. These attributes, I feel, constitute a sort of set of Kantian categorical imperatives; properties necessary to the nature of the proposition (in this case, a salad). They exclude some related foods, such as mixed nuts, dips and stews while effectively including salads ranging from traditional vegetable salads (leafy-greens-based or otherwise) to chicken, potato, pasta, tuna, and even Waldorf salads. The key, however, as mentioned above, is intent. What makes a salad a dish and not just a pile of random foods is that a Creator-figure (e.g. chef) intentionally chose the elements and combined them in a pleasing way. Whether working from a recipe or improvising on a theme, human creative energy is a necessary condition for a true salad. I know that this and other descriptors are controversial, and some people seek to modify salads in such a way that they cease to be salads. One common example of this is the situation in which people take a perfectly well-designed, intentional salad and ask that it be served without dressing. These are no longer salads; they are crimes against salads – aberrations of the lowest sort. This denies the plan of the Salad Creators and the salad's intended deliciousness. As a final note, I'll add that the dressing factor (Key Factor Four) was a tough call. Traditional fruit salad is considered by many a salad and excluding it was no easy decision. But I feel strongly that fruit salad, while delicious, is far more reliant upon the inherent tastiness of the fruit than upon the techniques, talents, and recipes of the chef. Oh, and the Cobb at Trio was pretty good.